Have not been creating for awhile, but don't worry, this is a planned break, I shall be back in no time. While I am taking a break, I continue to hunt for inspirations, to get myself ready to create something that would impress you, my dear reader. 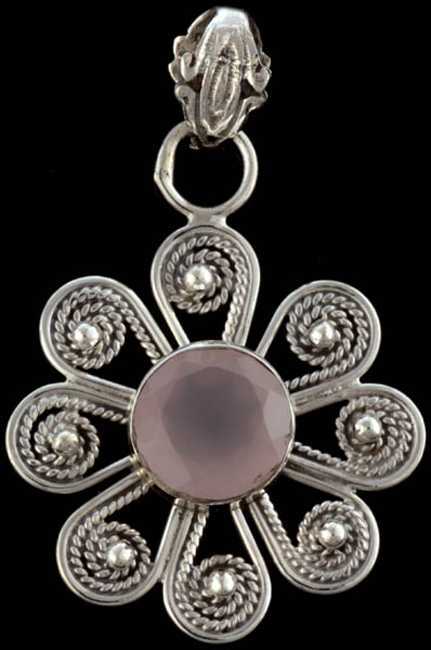 Check this out - Rose Quartz Pendant from India, available in Evaluestores.com. When I saw this pendant, the first thing that strikes my mind was - this must be a handcrafted piece of jewelry! And I was right. What surprised me was the faceted rose quartz gemstone is also handcrafted. Hmm, this is something I've never tried, and didn't think I will be able to try. But I like the sterling silver filigree petals hey. And according to the product description, this darling is 1.5 inches x 1 inch in width x .5 inches depth (38mm long x 25mm wide x 6mm), pretty decent for a normal wear I thought. Retail price at $98, and now it's on sale, $68.60 anyone?